Can’t attend? You can still help! Please consider donating. Pay with PayPal using the button above. If you prefer to pay by check, pay to the Order of Chicago Ornithological Society. Special Raffle @7:30pm: Tony Fitzpatrick Etching - valued at $700. ($35 per ticket. Advanced sales begin April 22. Must be present to win.) Use the button below to buy tickets - limited supply! Please join the Chicago Ornithological Society and our sponsors for a celebration of LaBagh Woods and the Lower North Branch of the Chicago River. This year’s event will feature live music, silent auctions, raffles, and the camaraderie of bird, nature, and habitat restoration enthusiasts. In 2017, we raised over $10,000. This year our $15,000 goal will allow us to continue the restoration of LaBagh Woods and expand into neighboring preserves along the Lower North Branch. 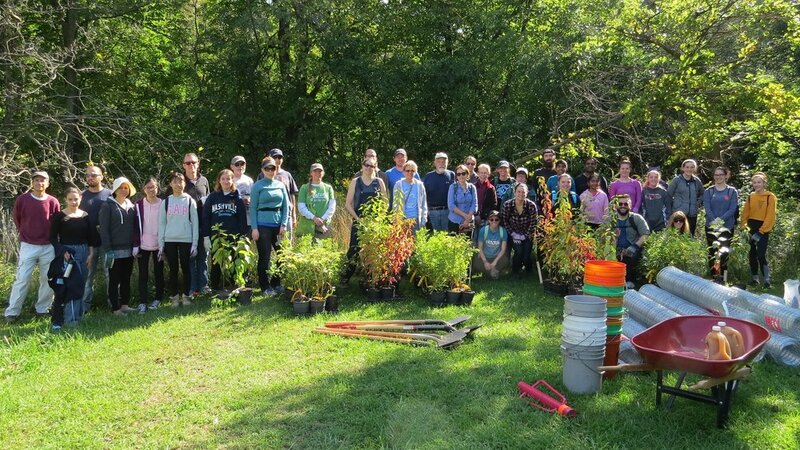 All proceeds will be used to purchase native shrubs and planting supplies to create a healthy native habitat for birds and other creatures along the Lower North Branch of the Chicago River. The Chicago Ornithological Society was founded in 1912 and is a registered 501(c)(3) organization. Attend! The $20 admission supports the project and includes 2 raffle tickets. Galway Arms will be selling food and beverages. Raffle Tickets and Silent Auction: We have an unbelievable lineup of items, including original artwork, birding experiences, books, sports tickets, museum memberships, and prize packages from local retailers and museums. Additional tickets can be purchased: One ticket for $5, five tickets for $20, twelve tickets for $40. Tony Fitzpatrick Raffle: Contemporary American artist and Chicago native Tony Fitzpatrick has generously donated a signed and numbered etching, valued at $700. Only 100 tickets are available for this special raffle. Advance sales will begin on April 22nd, 2019. Tickets are $35 each, no limit. Winner must be present to claim. Donate: Can’t join us Saturday night? Your $25 donation will purchase one native shrub and planting supplies. A $200 donation will sponsor a grouping of 10 shrubs. Thank you! Sponsorship: Interested in sponsoring our event, or providing merchandise for the silent auction or raffle? Please contact chicagobirder@gmail.com . Common Buckthorn is a European shrub that has invaded our neighborhoods and forests. Buckthorn grows and spreads quickly, forming a dense understory that crowds out the shrubs and plants that are native to Illinois. Buckthorn removal is a high-priority of state, county, and local governments, but unless the mitigated area is restored with native shrubs and herbaceous plants and ground covers, the buckthorn will return. The eradication of buckthorn also removes the understory, an important habitat layer for animals. This understory is particularly critical for birds, who use it for food, shelter, and nesting. Some of the most beautiful but threatened songbird species in the world, rest and refuel in Chicago during their spring and fall migrations. The stunning Prothonotary Warbler, the mascot of this event, flies thousands of miles during migration. Other species double that distance with their flights from South America. Birds are not the only beneficiaries; native plants also attract native butterflies, moths, dragonflies, caterpillars, bees, and other pollinators. The over 200 bird species migrating through or breeding in the forest preserves of the Lower North Branch of the Chicago River, must be provided with a healthy native understory. Recognizing the importance of an avian-based restoration, the Chicago Ornithological Society raises money to purchase native shrubs to re-create this understory. Funds raised over the past four years have been used to plant over 2500 native shrubs at LaBagh Woods, with an 80% survival rate. With this measured success at LaBagh Woods, we want to build on our success with more shrubs in LaBagh, with hopes to eventually spread that success upriver along the Lower North Branch. Thank you for supporting this volunteer-led project to support the world’s birds.